FSU’s Public Art and Architectural Art Specialized Studies Program is for undergraduate art majors. The program begins Spring 2013. If you are an FSU Art major and you have or will completer your Foundations requirements by the end of Spring 2013, you are eligible to apply. 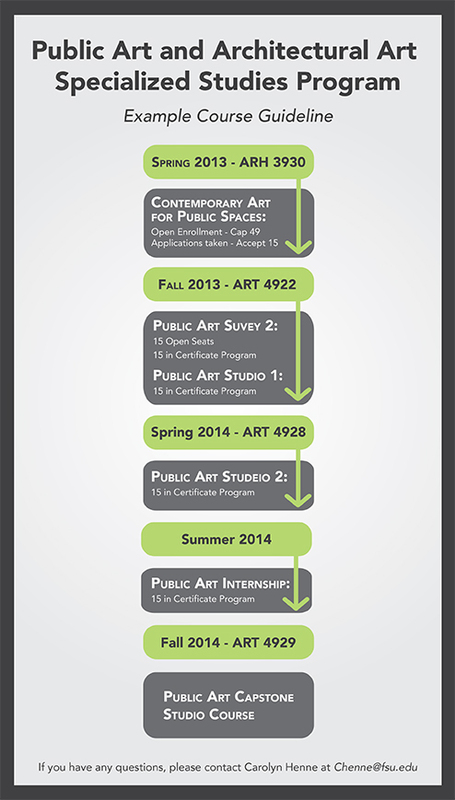 In order to apply, you must register for ARH3930 Contemporary Art for Public Spaces in Spring 2013. This undergraduate survey course will address key conceptual issues as they relate to the function(s) of public art/architectural art. Discussions will include the history, theories and models of public art, contemporary social/cultural issues associated with creating art for the public sphere, relationship to architecture/environment, and analysis of existing public art projects. Applications will be made available Spring 2013 to students enrolled in ARH3930 Contemporary Art for Public Spaces.